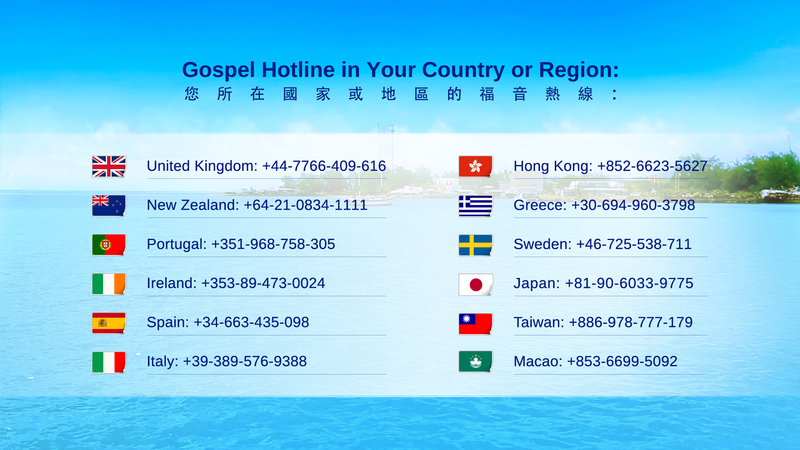 This entry was posted in Approach the Eastern Lightning and tagged Almighty God, Eastern Lightning, Incarnation, The Church of Almighty God, Truth on 2016-10-21 by summer sunshine. When I was nine, my mother took me to believe in the Lord Jesus because of my illness. Before long, I was cured. At the age of twelve, I was baptized into the Lord. When eighteen, I began to study the Bible and perform a variety of services in the church. Later, I had the honor of becoming a preacher. As the Lord granted me abundant grace and blessings, I was deeply moved and decided to follow Him for my whole life. However, during the service, I saw that my co-workers vied against each other, excluded and belittled each other, had jealousy and strife, and even fabricated accusations to frame others. I felt very puzzled. In one church I served, two pastors competed against each other for position and resulted in the separation of the church. So, I left that church sadly. Later, I went to another church, where the pastor was against two chairmen and they undermined and disagreed with each other. Feeling helpless, I chose to leave again. Then, as I was envied and framed by others in another church and underwent all sufferings, I could do nothing but go away … I saw that the churches everywhere were filled with man’s will and with the flesh, and were in complete darkness, without the work of the Holy Spirit at all. I didn’t know where to go. This entry was posted in Articles and tagged Almighty God, Holy Spirit, know God, last days, Life on 2017-02-16 by summer sunshine. This entry was posted in Articles and tagged Almighty God, God’s word, Salvation, the Creator on 2017-02-16 by summer sunshine. Each genuine follower of the Lord Jesus is expecting Him to come back soon so that his wish for years could be realized. And he can receive the Lord’s promise and enjoy His blessings. Especially in the end-time, our heart of longing for the Lord’s return becomes more eager. It is written in Acts 1:11, “this same Jesus … shall so come in like manner as you have seen him go into heaven.” And it says in John 14:3, “And if I go and prepare a place for you, I will come again, and receive you to myself; that where I am, there you may be also.” Therefore, the brothers and sisters firmly believe that the Lord Jesus will come again. Then, in what manner will the Lord Jesus come? Will He really come on a cloud as we imagine? Will the prophecies be fulfilled in the same way as we think? In what manner should we welcome His return? This is a question that each of us who follow the Lord Jesus must consider seriously. If we are careless, we’ll probably lose His salvation. This entry was posted in Articles and tagged Almighty God, God’s word, Holy Bible, Lord Jesus, Salvation on 2017-02-06 by summer sunshine. It was January 23, 2004 (Lunar January 2). A sister in the church badly needed help because of difficulty in life, so I must go and visit her. As the journey was long, I had to get up early or I couldn’t make a round trip. When it was just dawning, I went out. The pedestrians on the road were very few and there were only cleaners sweeping the garbage on the street. I was anxious, but no taxi could be seen in the street. So I walked to a stop at the roadside waiting for one. Seeing a car coming from afar, I went up and stopped it. Unexpectedly, it was a car from the Environmental Protection Bureau. The men in the car asked me what I stopped the car for. I said, “Sorry, I made a mistake.” They said, “We suspect you are one posting up illegal ads.” I asked, “Did you see that? Where’re the illegal ads I posted up?” Without allowing me to explain, the three of them rushed forward and forcibly searched my handbag. They took out everything including a copy of an article of fellowship and preaching, a notebook, a purse with cash in it, a mobile phone, a pager out of service, and so on, looking for the illegal ads. Then, they took the article of fellowship and preaching and the notebook and looked through them carefully. Seeing no illegal ads in my handbag, they held the article of fellowship and preaching and said to me, “You aren’t one posting up illegal ads, but you’re a believer in Almighty God.” Then, they phoned the National Security Team specially taking charge of religion. After a short time, four men from the National Security Team came. Seeing the things in my handbag, they immediately knew that I was a believer in Almighty God. Before I could explain, they stuffed me into the car and then locked the doors, for fear that I might jump off the car to escape. This entry was posted in Articles and tagged Almighty God, blessing, Christian, church, God, Gospel, Holy Spirit, Jesus on 2017-02-06 by summer sunshine. After reading God’s word, I know that the Bible is a history book written by human beings, which records the two stages of work God did. The Old Testament describes Jehovah’s work in the Age of Law, while the New Testament describes Jesus’ work in the Age of Grace. Through the Bible, man can know God’s work, and draw sustenance from God’s deeds, God’s word, and former apostles’ and prophets’ experiences of serving God. This is the reason why the Bible can influence many social fields. However, no matter how holy the Bible is, it can provide sustenance only to people at that time, and cannot provide life for people of present day. So, when God carries out a new work, only if man keeps pace with God’s newest work can they receive the new sustenance of God. 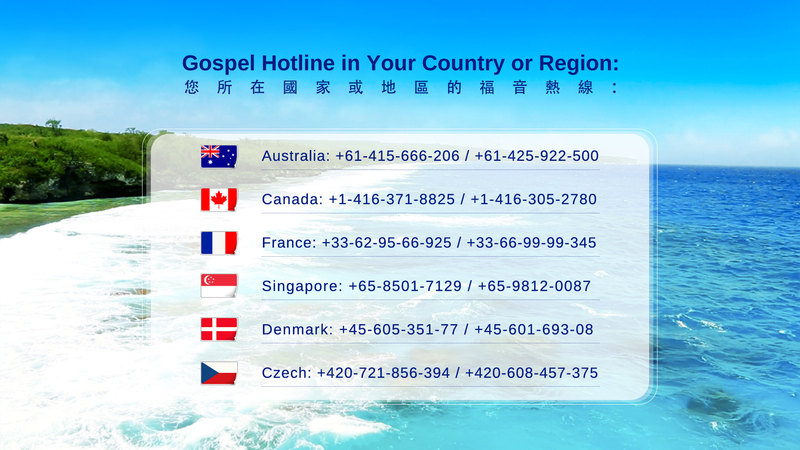 Now, the entire religious world is in the situation of committing sins in the day and confessing them in the evening, and the Bible can no longer give people what they need in life. And it is necessary for man to lay aside the Bible and accept the truth expressed by Almighty God in the last days, which is recorded in the book “The Word Appears in the Flesh.” The book is filled with the word of life Almighty God expresses to judge and purify people according to what they need in the last days, and is the only path by which people shall be saved and know God. Just as Almighty God says, “Christ of the last days brings life, and brings the enduring and everlasting way of truth. This truth is the path through which man shall gain life, and the only path by which man shall know God and be approved by God.” (from The Word Appears in the Flesh) If man can’t treat the Bible properly, stop blindly worshipping the Bible, or accept the word of truth uttered from Almighty God’s mouth, he will miss the opportunity to be perfected by God. Would that not be a great pity? This entry was posted in Articles and tagged Almighty God, Bible, Creator, God, Holy Bible, Jesus on 2017-02-05 by summer sunshine. I was born into an ordinary peasant family. I believed in the Lord Jesus because of illness at the age of 49. As I read in the Bible that the Lord could make the dumb speak and the paralytic walk , I often prayed to Him and asked Him to heal my illness. Unknowingly, my heart disease was healed, and I was getting stronger by the day. I thought, “So many people have spent a lot of money on their heart disease but to no avail. Mine is healed thanks to the power of the Lord. I must follow Him firmly.” At that time, I had a great faith. Unable to afford the carfares, I, together with several sisters, got up early and walked to meeting places, and I was never absent regardless of wind or rain. When I had time, I also went out to preach the gospel to repay the Lord’s love for me. Several years passed in a flash. Then, gradually I found that every time we came to the meetings, Brother Shi, the preacher of our church, always gave us messages on Genesis. He preached repeatedly on what God made on the first day, on the second day … on the sixth day. In the afternoon, the elder would teach us to recite the Bible verses. He also asked us to recite some verses at home. He said that only by doing so could we remember the words of the Lord and have eternal life. After returning home, I recited the verses every day. Sometimes for fear of failing to recite them in the next meeting, I even wrote them on my hands to have a look at them at times of forgetting. However, I still failed to recite them when the elder asked me to do so in the meetings. The other brothers and sisters were the same with me. As time went on, we believers began to feel bored and said it was useless and very tiring to recite the Bible verses. Everyone complained. Once, in a meeting, Brother Shi walked onto the pulpit, and he started to preach on Genesis again. My heart sank at what he preached, and I thought, “Why can’t he preach something new? Every time I gain nothing after a whole day of meeting. I have left a pile of work undone at home and sometimes cannot cook in time for my husband. All I wish is to understand and gain something here, but I don’t gain anything.” As I thought of this, I really couldn’t bear it anymore. So I nerved myself to walk up to the pulpit and asked Brother Shi if he could preach something deeper. He said with his head down, “Auntie, to be honest, I can preach nothing more than this; otherwise, would I not have given a deeper preaching?” I felt so bad to hear his words, but I could do nothing other than go back to my seat. Thus, the meeting attendance gradually dropped off. Whenever I looked at the empty gathering place, I felt so awful. I came before the Lord and prayed tearfully, “O Lord! Why is the church like this now? Why have we completely lost our former enthusiasm? I don’t know where the brothers and sisters have gone. Besides, the preacher is unable to deliver good sermons. Have You forsaken us? O Lord! Where are You? Please guide me!” After the prayer, I suddenly remembered the hymn “Many Crowd the Savior’s Kingdom.” I thought, “Have those brothers and sisters who are absent from the meetings all entered the kingdom?” This thought made me somewhat anxious. So I began to ask where those brothers and sisters had gone, but nobody could give me the answer. Over two months later, I dropped in on my sister-in-law. Hardly had I entered her house and sat down when a woman and three men came. To judge from their dress, they were quite decent and upright. My sister-in-law had a word with them in the outside room, and then she let them in. I hastened to invite them to be seated, and they nodded at me politely. Judging by their manners, they seemed to be believers in the Lord. So I asked, “I guess you are also believers in the Lord, right? What denomination are you from?” A man said, “Yes. We are from the Church of Almighty God.” When I heard the Church of Almighty God, I was so pleased, thinking, “Isn’t it the Church of Almighty God our elder and deacon spoke of?” The brother noticed my expression, and he continued, “The Lord Jesus has returned to flesh and done a new work. He works and speaks under the name of Almighty God, and He has expressed millions of words and disclosed all mysteries.” With that, he took a book out of his bag and gave it to me. I took it from him and found it was just the book The Scroll Opened by the Lamb that I had been earnestly looking for. I was so excited as to hold it to my chest and grin from ear to ear. I said to the brothers and sisters with emotion, “I have nearly broken my neck looking for this book. I have known for some time that the Lord has come back. The elder of our church already got a copy of this book. But he didn’t let the brothers and sisters read it for fear that they would all go to the Church of Almighty God once they read. So I had to search for it everywhere. Today I have finally found it! I am really grateful to the Lord!” At that moment, tears blurred my eyes, and all the brothers and sisters there were very delighted too. With tears in their eyes, they said, “Amen! God is faithful, for the Lord Jesus said, ‘Ask, and it shall be given you; seek, and you shall find; knock, and it shall be opened to you’ (Matthew 7:7).” Then, they testified to me the work of Almighty God—the returned Lord Jesus—in the last days. A young brother read me a passage of God’s word: “The work done at present has pushed forward the work of the Age of Grace; that is, the work in the entire six-thousand-year management plan has moved forward. Though the Age of Grace has ended, the work of God has progressed further. Why do I say time and again that this stage of work builds upon the Age of Grace and the Age of Law? This means that the work of this day is a continuation of the work done in the Age of Grace and an uplifting of that done in the Age of Law. The three stages are closely interconnected and linked one to the next. Why do I also say that this stage of work builds on that done by Jesus? If this stage did not build on the work done by Jesus, then in this stage the crucifixion, the work of redemption done previously, would still need to be carried out. This would be meaningless. Therefore, it is not that the work has completely finished, but that the age has moved forward, and the work has become even higher than before. It could be said that this stage of work is built on the foundation of the Age of Law and the rock of the work of Jesus. The work is built stage by stage, and this stage is not a new beginning. 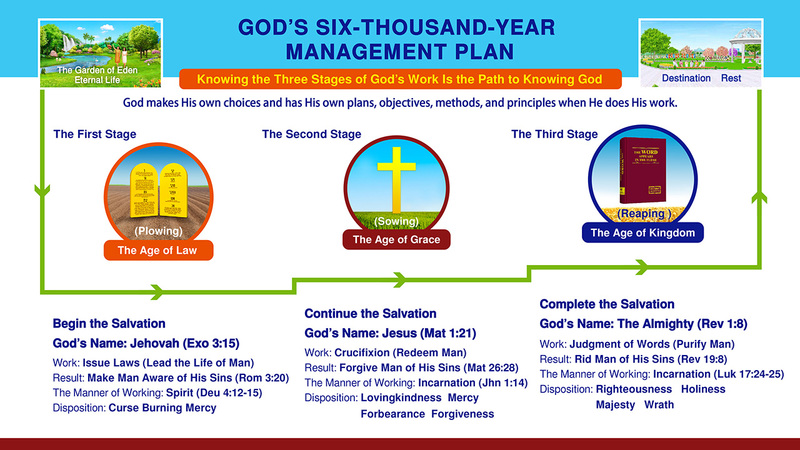 Only the combination of the three stages of work can be deemed the six-thousand-year management plan” (“The Two Incarnations Complete the Significance of the Incarnation” in The Word Appears in the Flesh). After the young brother finished reading these words, he fellowshiped, “Auntie, the three stages of God’s work are complementary and none of them is dispensable. They are imbued with God’s kind and thoughtful intentions….” He fellowshiped with me about the three stages of God’s work from beginning to end, including the work done by God and the names of God in the Age of Law, the Age of Grace, and the Age of Kingdom, and the significance of each stage of God’s work. His extremely clear fellowship was like a breath of fresh air to me. I thought, “What the elder of our church talks of is obsolete, which cannot supply our life at all, but what this young brother has fellowshiped is something new. It is so good and I have really received supply from him.” So I asked with a smile, “Brother, how many years have you believed in Almighty God? Why do you know so many things?” He replied sincerely, “I have just believed in Almighty God for two years, and I know all these from His words. If you read His words, you will know them too.” Then, they fellowshiped about many truths with me, allowing me to have more understanding of the three stages of God’s work, especially His work in the Age of Kingdom. Back home, I began to read the words of Almighty God voraciously. Almighty God says: “The first part of this book is the words of the Spirit to the churches. These words represent the transition from the end of the Age of Grace to the beginning of the Age of Kingdom, and are the Spirit’s public testimony of the Son of man to the churches. They are also fulfillment of the words in Revelation that ‘He that has an ear, let him hear what the Spirit said to the churches.’ This is the work that God began in the Age of Kingdom. The second part of this book is the words personally spoken by the Son of man after He officially revealed Himself. It includes a rich content of several types of utterances and words such as prophecy, the revelation of mysteries, and the way of life. There are predictions for the future of the kingdom, revelations of the mysteries of God’s management plan, dissections of the nature of man, exhortations and warnings, severe judgments, heartfelt words of consolation, talk of life, talk of entry, and so on. In short, what God has, what He is, and the disposition of God are all expressed in His work and words. Of course, when God becomes flesh this time, His work is to express His disposition, primarily through chastisement and judgment. Using this as the foundation, He brings more truth to man, shows more ways of practice, and so achieves His objective of conquering man and saving man from his corrupt disposition. This is what lies behind the work of God in the Age of Kingdom. Do you wish to enter the new age? Do you wish to rid yourself of corrupt disposition? Do you wish to obtain higher truth? Do you wish to see the true face of the Son of man? Do you wish to live a life that is worthwhile? Do you wish to be made perfect by God? Then, how will you welcome the return of Jesus?” (Preface to The Word Appears in the Flesh). After reading these words, I couldn’t help but utter praises from my heart: “The words in this book are truly the utterances of God Himself—this is absolutely right! Only God Himself is capable of expressing all these truths. God’s words are so tender that I feel as if I saw God’s face when reading them.” I was thankful to have found this book, and I read it every day and could hardly bear to tear myself away from it. In twenty one days, I read it through twice. Every word of God has touched my heart, nourished my spirit and quenched the thirst in it, and God’s words have also led me to keep up with His work of the last days. May all the glory be to Almighty God! 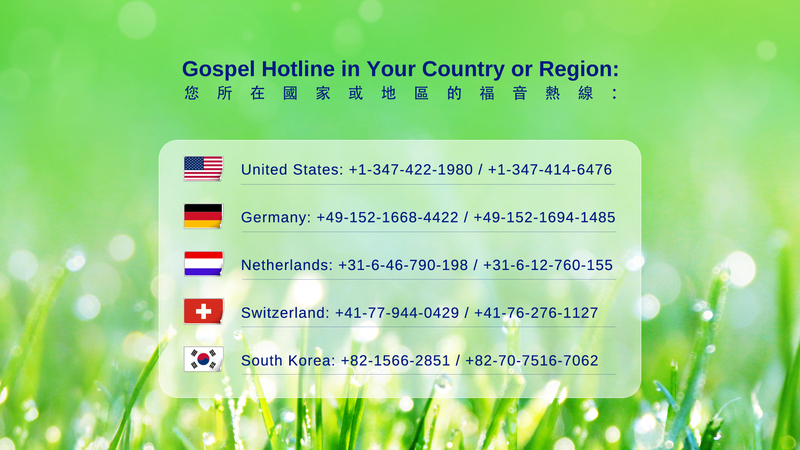 This entry was posted in Articles and tagged Almighty God, church, Eastern Lightning, God, Gospel, Incarnation, kingdom, return of Jesus, savior, The Church of Almighty God on 2017-02-05 by summer sunshine. In 2015, I was sent to work in another city by my unit. At that time, because of being stuck at work, I could not go to church every Sunday. After getting married, my husband was an unbeliever and I just arrived in a new environment, so I lost the life of fellowship. Afterward, my parents passed away and I also remained sick without improvement. I then unconsciously lost confidence in the Lord, prayed less than I used to and often lived in weakness. Even though I was busy all the time, I felt particularly empty. This entry was posted in Articles and tagged Almighty God, Bible, God’s word, Lord Jesus, Salvation on 2017-01-28 by summer sunshine.